Two parties in 24 hours. Is it crazy? Is it efficient? Is it feasible? Well, we did it. Last weekend. Here are my thoughts. because I am a reluctant entertainer. Yeah, I know. Letsjustbehonesthere. I was the kid who hid behind my mom's legs when grown-ups asked me a question. I was the kid who went into the tool store with my babysitter and refused to say the phrase that would allow her to purchase a tool at half price (seriously a strange gimmick - have a kid come in and say your store rocks and get an item 50% off. Fortunately, the other 3 kids said it, so she got the deal.) I'm the college freshman who turned quietly to the oboe player beside her and whispered, "Will you be my friend?" The mom who volunteered to be the PTO photographer cuz I get to hide behind a lens. Yeah. I'm a little reluctant to invite people into my sanctuary. But I also love planning a party. I love figuring out a theme - or a no theme. I love browsing the web for decorations and recipes. I love trying new things. And I love having people here. Yeah. It really is a dilemma. So two parties within 24 hours of each other. We debated the benefits and drawbacks. Clean the house - once. Buy food - once. Clean up --- twice. What could be wrong with it? We were running out of days to have people over. Hubby wanted his team of employees. I wanted some of our heart friends. One weekend. We decided to go for it. Saturday the temperature bordered 100 degrees with heat index over 110. Good thing we have a pool. People arrived with their kids. The young people swam while the little people threw floaties from the wading pool into the big pool and wary parents repeatedly pulled them back from the edge of the pool. And they sweat. And drank and ate and met each others' kids and spouses. And they ate and they drank. Everything we'd bought. To last through two parties. Gone first night. Oops. We recycled bottles left out and washed the dishes from dinner. We cleared the pool of toys and went to bed. Employee party: 18 people who love and work with my husband on a daily basis ~ A Success. We talked and we ate and we watched our kids and we spent an afternoon loving and getting to know each other better. Another Success. So, the moral of this story? Two parties is a ton of work. It's not half the work for twice the fun. It's twice the work for all the fun. That's just all there is to it. With the exception that I didn't feel the need to clean the toilet both days. And I suppose we didn't have to sweep the walnuts off the sidewalk twice or mow the yard twice or put out the tables twice. But, in the end it did still feel like a ton of work. Wanna know the honest truth, though? Any amount of work or not would have been well worth it. 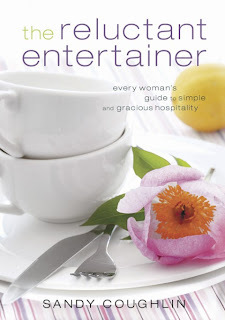 Would-be-hostesses will discover that true hospitality is not about being perfect, cooking a fancy meal, or spending a lot of money. Rather, it’s about an open door and an open heart! ...a wake-up call to women of today’s generation, who seem to have lost the conviction that relationships matter more than appearances. The Reluctant Entertainer gives women of all ages a much-needed boost of encouragement to take a step of faith and use their home in service to others. I think I'll be reading the book cover to cover.